Chapter 3: "The Asylum Stone"
The search for the Shattered Star leads the PCs to Kaer Maga, the legendary cliff-top city of criminals, refugees, and anyone else seeking to vanish into its cluttered streets. Enlisted to rescue a troll prophet from a mad artificer’s hanging mansion, the PCs soon find themselves delving into the notorious Undercity. Here they must battle their way through a lost runelord laboratory before finally entering the mysterious cavern realm of the Dark Forest, where an ancient evil has guarded a lost shard for millennia. Can the PCs recover the shard from its unholy guardians and continue their quest, or will they simply be the latest souls lost to the City of Strangers? 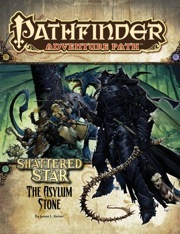 The Asylum Stone is sanctioned for use in Pathfinder Society Organized Play. The rules for running this Adventure Path and Chronicle sheet are available as a free download (512 KB zip/PDF). One of the Most Creative, Challenging and Enjoyable Adventures Ever Written! I ran The Asylum Stone for my ongoing mythic campaign. 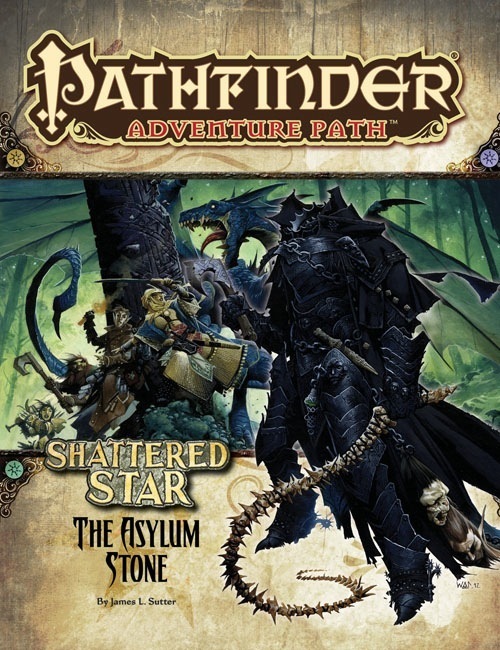 Instead of running it as part of the Shattered Star adventure path, I added several Kaer Maga based modules (Godsmouth Heresy & Seven Swords of Sin) early on to build the setting and give the players familiarity. As my players are mythic, I gave them early visions of the Dark Rider and this helped build the tension in a fantastic way. My headline pretty much says it all. I've played or run classic modules from the days of the Temple of Elemental Evil and Tomb of Horrors all the way to the Pathfinder era and what James L. Sutter has created will stand alongside the best of them all. If you're interested in running this for a mythic campaign, I am posting my mythic adjustments in the GM's thread on the Paizo forum. Ignore the negative reviews. This module has it all. It is filled with factions and flavor to give great roleplay. The action is varied and the monsters are imaginative and awe inspiring. The Dark Rider should become an iconic villain that your players will talk about for years to come. I know that mine do. Pick up this book and the supplement City of Strangers to bring this to life in a way that you never imagined before. Buy it and run it today! I ran this chapter as written for a group of 4 PCs as part of my ongoing Shattered Star campaign. At last, Kaer Maga! The Asylum Stone! The City of Strangers! And strange things you shall encounter, indeed... This adventure is a ride from one weird and strange set-piece to another. If you want something that sticks more to a single theme or moves more gently from one site to another, look elsewhere. If you are interested in a sample platter of what Kaer Maga has to offer, this is exactly your thing! We fell into the second category and greatly enjoyed playing through this chapter. The only downside is that the main villain is not introduced early enough in the adventure to make him and his lair feel truly legendary. It may work as written for some groups, as long as the GM stresses his importance in Varisian folklore, but for other groups you might want to seed rumors and superstition regarding him from day 1 of your campaign. Like I said, this adventure is definitely not for everybody so think about your and your players' taste before picking this up. We definitely had a blast, even though it was missing that little something extra that would have made it a 5 star experience. I loved City of Strangers and, in general, all of what James Sutter writes but, sadly, this AP chapter didn't work for me and I don't think my group would have appreciated it. Without being my favorite part of Varisia, Kerr Maga is still fun and I was looking forward to The Asylum Stone. But even though some parts of it would probably be fun to play through (the Ardoc villa, the Troll Augurs, the Caulborns), most of the two main dungeons seem filled with somewhat random creatures that have little in common. Some of these encounters are really good, but I find the randomness undermines them. One or two odd creatures would have been fine, but many strange creatures in adjacent rooms would have broken my group's sense of verisimilitude. Maybe Kerr Maga is just not for me/us? So the dungeons and enemies are all great, but the problem in this adventure comes with the number of assumptions it makes about what the PCs will do. It included two largely unnecesary encounters on the way to Kaer-Maga (If there's only going to be one encounter in a day, it isn't worth unless sufficiently challenging/epic), and assumes that the players are going to get a guide (isn't their mission kind of private?) and that it's going to be Gav, and that they'll tell him exactly what they're looking for. The only two ways to advance the story is to either inquire with the Augers, or check out the Therassic spare, and if the PCs do the latter first, they skip around the first third of the adventure. The support articles aren't fantastic either. I was really hoping the Gangs of Kaer Maga article would talk about the groups that weren't already talked about in the adventure, and the Missions in Magnimar article didn't really add anything to the world, which is what I normally look for in the support articles. The bestiary, at least, was interesting, though there were only four monsters. Sutter also makes a lot references to his own works, including City of Strangers (duh), Distant Worlds, and oddly enough his fiction in AP #3. The latter was extremely unnecesary, but I suppose it didn't really take anything away from the adventure. So overall the adventure itself was fun and enjoyable, though I had a bit of problem with the details. My group enjoyed playing through it, but I had to adapt a bit to get them to actually go into the dungeons. Unfortunately, The Asylum Stone just doesn’t live up to the possibilities, primarily because it tries to present too many possibilities all in one go. Just as Kaer Maga itself is a hodgepodge of numerous races and organizations, the adventure is like a hodgepodge of disconnected set-pieces with only the thinnest thread linking them together. But while the city of Kaer Maga brilliantly ties all its disparate parts together into one working whole, The Asylum Stone unfortunately doesn’t. There’s simply too much in Kaer Maga to include in one adventure, especially one where the PCs are just passing through. What would work much better is to focus on one aspect of Kaer Maga (much like The Godsmouth Heresy does) with only hints of the rest. What we get instead is an adventure which takes the PCs from one Kaer Magan “gang” to the next with little to no opportunity to interact with each one, only to throw the PCs up against one of the setting’s major villains at the end without ever developing the threat of that villain or its impact on the setting. The adventure ends up feeling like a succession of random encounters and completely loses the magic of Kaer Maga. Announced for October! The cover is a mockup and will change prior to publication. Aww man, who had the bright idea of letting Sutter write an adventure in Kaer Maga?! Now no one's gonna talk about anything else for like forever! Yay!! An adventure written in my favorite city written by the Author that wrote the book about my favorite city!! This one'll have elements from Distant Worlds too. This might be my most anticipated adventure since Wake of the Watcher. I'm sure it's just a total coincidence that this adventure is 7th-level, set in Kaer Maga, and related to the Runelords. Well an exotic city adventure might be fun. Actaully, it is total coincidence. Kaer Maga? More Kaer Maga? And Distant Worlds as well? And a good look at the different factions too? With James Sutter? I need this adventure Path. Yep, and if i know my Players they'll have plans to rent rooms at The Strapping Lad as soon as they hear about this book (because appropriately named brothels are always appropriate for every occasion). Well damn, that worked out nicely, then. We published that adventure 5 years ago. We chose 7th level because that's the most commonly requested, most popular level for adventures to take place at, it seems, and since that module was to be one of our first Pathfinder adventures, we wanted to hit that level first. The fact that this AP installment runs from 7th to 9th level is more a factor of it being the 3rd adventure in an AP line than it does anything else. I'm really looking forward to this AP. REALLY looking forward to having another adventure set in Kaer Maga. I do have one question, more of a curiosity really, will we get to see Janderhoff in this AP at all? ...but we won't be going there in this Adventure Path. That's good to know. I keep hoping that a little more info on the city crops up, so I'm looking forward to seeing what's in the Varisia Player's Companion. I'm a bit sad that Janderhoff won't make an appearance, but I'm not shocked by it either. Either way I'm really looking forward to this AP. Oh, hey! I didn't realize we'd announced this. Thanks for the enthusiasm, everybody! And yeah, I believe I mention in a sidebar somewhere that you can easily slot 7 Swords of Sin in there to make an enormous adventure EVEN BIGGER (though I hope that my adventure-writing chops have improved over the last 5 years)! Fortuitous! We do have plans to go to (or near) Janderhoff in the forthcoming season of the Pathfinder Society campaign as part of the Year of the Risen Rune. Wait, slot seven swords of Sin into Shattered Star? that works? This is exceptional then. Definitely cannot wait for this one! The dude on the cover looks exactly how I imagined my ranger I currently play in a homebrew - need the mini! I'm not a regular AP customer - but I am really excited for this one now. Any chance on getting some illustrations of how the different districts in Kaer Maga actually look like? Something like one panoramic illustration for each of the city's districts. That is the only thing that I felt was missing from the City of Strangers book - and if it was included in this book it would make me even more excited for it than I already am. While I'd love that as well, I think it's pretty unlikely. Since this is an adventure rather than a sourcebook, most of the art will likely be depicting encounters, NPCs, and monsters. Still, we'll try to get as much of the surrounding environs in there as we can! How the heck did I miss this before? And as an aside, art for the districts in Kaer Maega would be nice.......in the giant Kaer Maega boxed set that I just KNOW will get released in 2013 as a Golarian mega dungeon. Since this is an adventure rather than a sourcebook, most of the art will likely be depicting encounters, NPCs, and monsters. Still, we'll try to get as much of the surrounding environs in there as we can! Now you are just going to have to write one illustration-worthy encounter for each city district into this adventure. See? Problem solved! Seriously though: no need to feature every district. I fully understand that would be outside the scope of an adventure. And I am happy to hear that you are trying to stuff as much environment as possible for this format! Every bit of city backdrop will be appreciated! Death's Heretic ... sequel ... Kaer Maga. Well, SUTTER, you made me SPLUTTER my coffee all over the screen. Proud of yourself now, little froggy? PROUD? While I have many authors that I love to read, until recently there has only been one who I almost literally count down the days until their next release in anticipation (Brandon Sanderson). I say until recently because after reading City of Strangers and Death's Heretic, James Sutter's name was added to that prestigious (in my mind) list. I second that so I hope Reaper is listening. I know we have stats for the iconics, what about the newer people on the cover like this character? This cover is a mockup. The body shot shown on the mockup was originally published in Pathfinder Campaign Setting: City of Strangers and it depicts a Duskwarden. Typically, folks on the final covers DO have stats as they are usually someone important to the adventure. The Dark Rider is coming. I've updated the image and description to match the finished product. I really dig the background spread on this cover. That "chain o' heroes" formation just brings back memories of the "hanging from the stalactite" Goonies posters and other similar images from the 80's. Those always made for fun character showcase images. Really excited to see those troll fortunetellers finally getting some time in the spotlight. And as questgiving NPCs and hostages at that! I love Kaer Maga. Really excited to dig deeper into that city. It's a great and well-deserved revisit! Awesome cover. At first it looks a little funny with the dragon's head sitting slightly off on the armored body's neck, but looking closer it's getting even better when you realize we have a dullahan plying his trade and the PCs battling a blue. Awesome! Can't wait for revisiting Kaer Maga - my players really digged Seven Swords and the feel of the city. Not a fan of Mos Eisley, er... Kaer Maga at all, which is really putting me off a bit about this AP which otherwise sounds fine. I really really wouldn't want to run adventures in Kaer Maga. Hm. Oh hey that's where that picture's from! The main painting is part of the spread in the new product catelog for the Visions of WAR book, and I'd been wracking my brains for where it was from! You know for a minute there I thought that dragon's head was coming from the knight's body instead of the background. So I was thinking, cool, the black knight and the dragon are one in the same. That was my first impression, too. Yet another Wayne "Little Feet" Reynolds cover. Too bad. Be ready for some disappointment then - the entrire AP will be Wayne's covers. That's the first complaint I've ever seen about Reynolds. Can't please everyone. I'm not so sure its a blue dragon. We've seen quite a few Wayne Reynolds Blues illustrated for Paizo (Game mastery guide, bestiaries, and Pawn sets to name a few), and the head of this dragon doesn't match the pervious illustrations. Also there's a stinger on the Dragon's tail. Could be artistic liberties, or perhaps we're looking at something new (one of the Primal's perhaps)? EDIT: Its wing's are translucent, some type of shadow dragon or umbral dragon perhaps? According to Wayne, on his Facebook page, it's a wyvern.